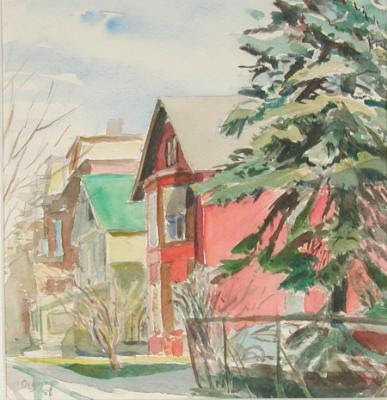 The subject of the watercolor is the morning light and the patterns it creates – as seen on Woodlawn Avenue south of Van Dam. Often when selecting a location I would start driving around, keeping in mind the direction of the light and locations I had been considering. Then I would look for a place I could park and paint from the front seat (particularly in cold weather). For this composition I chose to contrast the natural shapes of the tree on the right with the shapes and lines of the houses. Yet in terms of color the contrast is between the red house and the surrounding greens and yellow greens. The touch of blue in the sky is positioned in counterpoint to the dark triangle of the red house, while the grey tones of the sky and roof flow together.